Perhaps I should not let you in on a little secret: Occasionally one of our beloved Central Oregon quilt shops has spectacular Scrap Bags for sale for $8. I promised a couple quilting friends I would not reveal which shop (so that everyone does not suddenly get in their car or jump on a plane to rush to Central Oregon to get some of our Scrap Bags!). I have plenty of fabric scraps (most are from my own quilt making or were donated by friends) and normally I do not buy these bags – but it was one of those deals not to be passed up! Each scrap was folded/pressed in half. I was curious how wide and long the scraps would be once opened. TTQH was so patient as we sorted the scraps by color/pattern. They took up my entire cutting table and spilled onto my ironing board! I flipped through this book to get a feel for the dimensions of the pieces requires to complete the blocks for this sampler and in general they were within the dimensions of the scraps from my $8 bag. I just need a coordinating fabric to fill in when large pieces are needed. It could also serve as a very bold setting fabric for the blocks! I have so many projects in queue, I am not ready to start this one (for example I still need to finish up my Farm Girl Vintage sampler!). So I sorted the scraps into color stacks and packaged up the scraps and put them away in my Project Queue! Where did these scraps come from? My best guesses are they are either leftovers from a sampler quilt created for the quilt shop; or from cutting kits for the shop. I do not care where they came from, I am just so grateful for them! Look at these adorable socks one of my Quilting Sisters gave me. Hopefully the salty word in the socks does not offend anyone, if so then my sincere apologies. One the years I’ve grown to appreciate fabric scraps, especially coordinated fabrics scraps shared from other quilters’ projects. I have gathered a collection of coordinated fabric scraps donated by quilting friends. 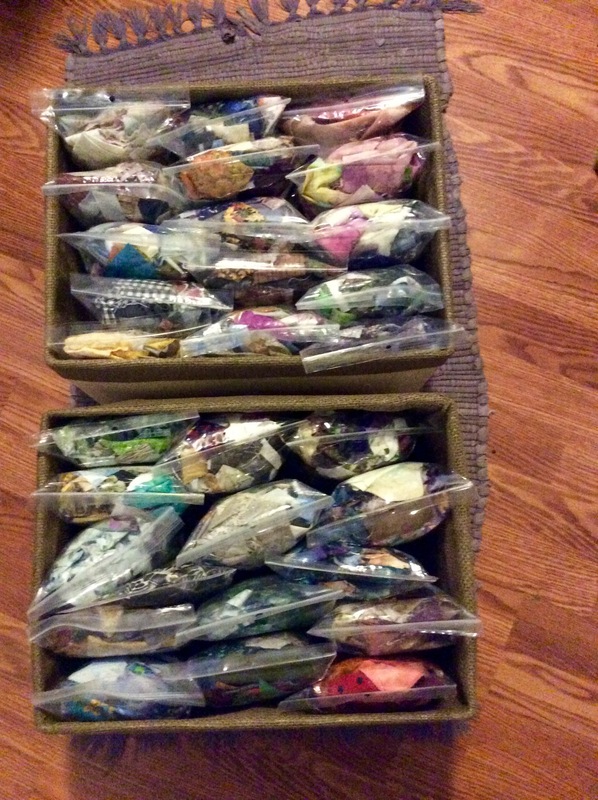 Each collection of scraps is organized in a plastic bag, which I call a “challenge bag“. Each bag is a challenge to create something from a fabric scrap collection otherwise destined for the trash. While going through the challenge bags to move them from the storage containers to the open basket, I figured it was time to work on one of them. Yesterday I hiked Pilot Butte (miniature mountain with 360 degree views of Central Oregon and surrounding region) and nearing the summit I took a photo of a controlled burn off in the distance. The US Department of Agriculture Forest Service has to do controlled burns in the Deschutes National Forest to control forest fires. If you are new to my blog and wanted to read more about my Pilot Butte adventures, check out this link: Pilot Butte Adventures. For those of you who have followed me for a while – yes, on my hike yesterday, another Senior Citizen dusted me on Pilot Butte. At least the 80+ year old (maybe even 90) was kind enough to wish me a “good day” as he effortlessly walked around me on the hike back down the Butte! Saturday I hung out with a quilting colleague and we had a “Pinwheel Piecing Party” in her home studio. I was handed a bag of Moda triangle scraps that were already pieced into 1.5 inch blocks, so I could make them into pinwheel blocks. I turned them into a Pile-o-Pinwheels! No, I do not know what I am going to do with all those pinwheels but I will have them available for when the design for the piece they would be perfect for appears in my mind!